THE SAXTON MAP, 1579 AN INVESTIGATION: Information for a large number of maps was surveyed, engraved and published in an amazingly short length of time for the era and tools available. Just how was this achieved with considerable accuracy, and what followed? The map depicts both England and Wales and was one of 35 coloured maps forming an Elizabethan era landmark publishing feat; a complete set of maps. It is the first atlas of England and Wales, and as such, set the standard for all that followed. Undoubtedly a cartographic tour de force in presentation and accuracy, it followed other representations such as the Gough Map and the Angliae Figura1. Although highly decorated it has none of the fantasia associated with many maps of the era. It is a working map, except that it fails to include the roads of the Elizabethan age2. That however, is easily reconciled given the turbulence of the time. Such information would have been a gift to invading army commanders. In 1548-60 there was the French intervention in Scotland to support Mary Queen of Scots: Calais was lost to the French in 1558 and the Spanish Armada intended invasion in 1588. However it does indicate a large number of Castles which may prove a corollary to that point3! There are minor discrepancies in the information regarding Saxton, but his general history is as follows: Born, probably in Dewsbury, Yorkshire c1542, he was an employee, or apprentice to the polymath vicar of Dewsbury and Thornhill, John Rudd. He being a surveyor and cartographer, as well as a vicar, appears to have been given leave in 1561 from his duties to complete an earlier project, a map of England and Wales2. It is thought that Saxton accompanied Rudd on his travels thus gaining valuable experience. Later, having established himself and moved to London, Saxton was chosen by Thomas Seckford to survey and map the counties of England and Wales. This was no doubt at the instigation of William Cecil, Lord Burghley who provided Saxton, via the Privy Council, with an open letter to all Justices of the Peace in Wales to aid and assist as possible. Thus from 1574 to 1578 Saxton surveyed 52 counties, produced 24 maps of individual counties and 10 maps of county groups. Given that the survey season was probably from Lady Day, 25 March, to Michaelmas, 29 September, six months per year were also available for the actual drawing of maps. The work load was therefore quite prodigious. That is, 30 months to survey 52 counties, and 30 months to draw 34 maps! The first county maps, Norfolk and Oxfordshire were published in 1574 and the final maps of Wales in 1578. Finally in 1579, combining the data he had assimilated, the first full map of England and Wales was produced. In 1533, Gemma Frisius, in Louvain, Belgium published a treatise in which he described the method of surveying known as triangulation4. That is, when a base line of fixed length between two survey points is established, nominally church towers or castle keeps, then, from those points angles are measured to the next similar positions. After the first measurement no further distances are generally required except to ascertain the veracity of any final point-closure. In England there were several works published to aid the surveyor; Leigh, 1562; Cunningham, 1559; Bourne, 1571 and Digges, 1571, as well as the extant maps already mentioned5. The idea of triangulation as a means of surveying was included in these treatises. Although the dissolution of the monasteries was well advanced by this period, (there had been some 1800 in England and Wales), these would have provided marvellous survey points for triangulation6. Add to those the more than 200 castles in the landscape and we find Saxton had some 2000 vantage points to utilize3. Thus Saxton would have had available, in the 10 years preceding his commission of 1573, a wealth of data to aid him in his task, and the means to carry it out from church premises and the numerous castles in the landscape. This investigation has been carried out using, British Museum, Maps C.7.c.i, facsimile copy dated 1969 (purchased in 1971). It is the final draft copy of Saxton’s 1579 map and includes the bordure scales7. But, the original printing of the map was minus these scales, with only the centre line longitude and latitude marker cartouches for reference. These would normally represent the mid-latitude and mid-longitude of the map and have been used to form the primary graticule on which the map was drawn. Curiously they do not appear parallel to the outer bordure or map frame, but this may have been a quirk of draughtsmanship. However once the actual latitude and longitudinal markers were set down, it should have been obvious there was a tilt of the original map base graticule to the west. Thus the bordure profile and the map base are at variance. Cs1D01 illustrates the composition of the map as per the facsimile copy. The scale bar is a plain scale which cannot accord with the tapering longitudinal scale, added after the map was drawn. Therefore the longitudes measures of 30, 33 and 36 miliarium set to a latitude degree measure of 60 miliarium, (and the corresponding ratios as noted) must be taken as an attempt to portray reality, but a much exaggerated reality. The actual lines of latitude are marked out with reasonable accuracy (see later discussion). The lines of longitude, have been set out no doubt, intending one point on the map to be a prime meridian set from Cape Verde, 23° 34’ west of Greenwich. 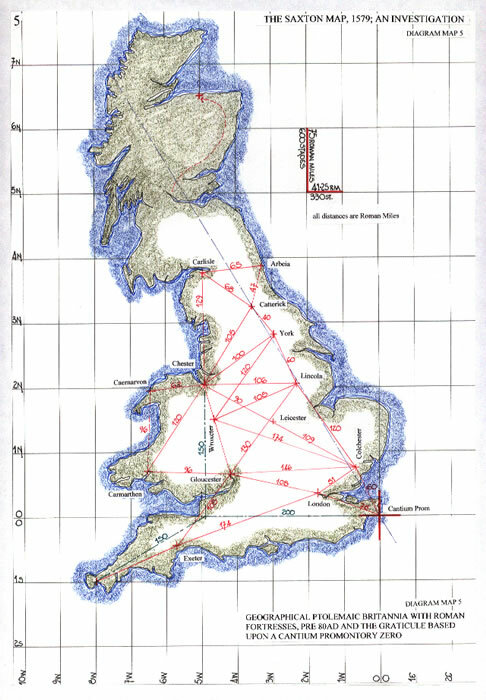 The ancient cosmographers have signalled that Cantium Promontory, the South Foreland, 51° 07’N: 1° 23’E is the determining point for both measurement of, and the positioning of Britannia, viz., the European littoral8. Saxton indicates the 25°E longitude close to Cantium Promontory and thus we can deduce Cape Verde is 23° 37’ west of Greenwich to accord with that 25°E, and state, that the Capital, Praia, is actually 23° 34’ west. We can also assume that when the Portuguese ‘discovered’ the Island chain in 1460AD, the details were later shared with their oldest ally, England! That is of course, if we ignore the evidence from Claudius Ptolemy! Thus if we study Cs1D02 the graticule problem can be assessed. Diagram 2A indicates the actual graticule projection of the maps bordure, with two original centre line markers dotted thereon. The latitudinal centre line which is approximately 53°N, according to Ptolemaic methods would have a cosine ratio of 0.6 (which is 53.13 degrees), or as Claudius Ptolemy would have written 69/115. That is the scale ratio of the south bordure. Hence Diagram map 2B is drawn forming a graticule projected from the south bordure of 36 miliarium. This is therefore a true Ptolemaic construct of 11/20 ratio. However it is still at variance with the original centre markers. It is therefore necessary to slightly re-orientate the graticule and balance the proportion appropriately. Cs1D03 uses the longitude map centre as a north/South alignment and the 530N western bordure point to construct a Ptolemaic graticule of 60: 33 miliarium, the 20: 11 ratio of Claudius Ptolemy’s Geography11. Again, observe that the 25°E longitude is a close marker for Cantium Promontory, and the overall width from Lands End corresponds to Saxton’s original graticule. But to draw this map the survey details available must be analysed. We are informed within 4th century AD texts that Julius Caesar instructed surveyors to produce a Mappa Mundi of the known (Roman) world. This was completed in 18BC and later enhanced by Marcus Agrippa aided by his sister Vipsania Polla and finally completed by Augustus Caesar. T P Wiseman9 discusses this scenario and argues cogently for its veracity using the texts included upon the Mappae Mundi, Ebstorf, Hereford and Cornwall. These are texts attributed to Julius Honorius and Aethicus. But, the province of Britannia was only formed after the invasion of 44AD, by the Legions of Claudius. If such a Mappa Mundi existed it would be natural for an Emperor of Rome to require that the latest addition to that Empire be included thereon. Thus we can consider that the island of Britannia was surveyed9. Can we indicate that Britannia was surveyed; the answer is a resounding yes! Cs1D04 indicates a simplified view of the survey data, but includes the most important of the Roman survey plots10. From Cantium Promontory to Chester it is a precise 250 Roman Miles. 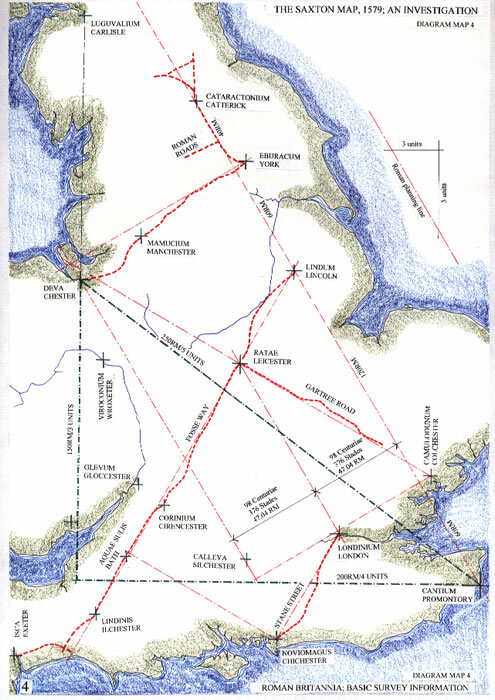 Based upon that distance a west line can be projected from Cantium Promontory and a south line from Chester. Where these two lines meet the distances, which are the sides of a right angled triangle, can be measured and will be found to be precisely 200 Roman Miles west and 150 Roman Miles south. Thus in the landscape we have a survey tool, a right angled 3:4:5 ratio triangle which has for its north/south side a distance of precisely 2 Roman Latitudinal degrees, or 150 Roman Miles. The geographical distance is actually 2° 05’; a remarkable feat. Thus this surveyor’s tool, a perfect triangle of 3:4:5 side ratios can be used to test the accuracy and veracity of the map. But we cannot test a medieval map against a geographical or OS map. The projection of those would have been unknown at this period. To compare like for like, any map suspected of being drawn to Ptolemaic parameters must be compared to a Ptolemaic projection. It is fallacious to compare such maps to geographic or OS base maps. 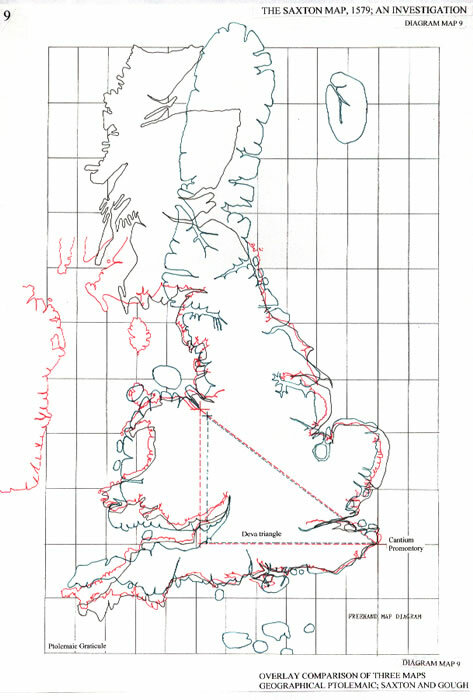 Thus a new map was drawn by the author based upon calculations taken from OS co-ordinates for the profile of Britannia; ratio 11:20 graticule of 0.184KM per Stadion and zeroed to the original ancient cosmographers base point of Cantium Promontory. Cs1D05 illustrates the projection and has appended the Chester/Deva survey triangle and the inter-distances of Roman Fortresses established prior to AD84. This information is contained within the text of ‘Claudius Ptolemy’s Geography’ and must have been surveyed by the Roman Army11. The information would have been transmitted to Alexandria, Egypt, prior to Claudius Ptolemy composing his ‘Geography’, c150AD. Perhaps, it was even prior to 100AD when Marinus of Tyre produced his maps. Those are the source of Claudius Ptolemy’s work as he clearly states. In order to fully compare base maps, parameters must be established. The Saxton Map scale is 50 Miliarium represented by 57.5mm length. Using known distances between significant places, e.g. the original Roman Fortresses, the precise length of the Miliarium and its conversion ratio to the Statute Mile and Roman Mile can be assessed. Diagram map 6 indicates this for the Saxton map of 1579AD. Set out in the table are the comparable distances and their accuracy ratio. Thus it can be shown that the Miliarium used by Saxton is the equivalent of 1.2 Statute Miles or 1.3 Roman Miles. This is of course simple mathematics, and for that age it required to be! The Statute Mile is 63360 inches which has been thought of as 10 Stadia. Thus 6336 becomes the number used; convert that number to statute feet and we have 1.2 Statute Miles, the Miliarium. The Roman Pes equals 11.64706 (11.65) inches and 6336 Statute Feet equals 6528 Roman Pedes or 1.3056 Roman Miles. Hence from Statute Mile, 10/10, the Miliarium is 12/10 and the Roman Mile equals 13/10. These units are the basis of The Saxton Map scale12. Therefore we can retro-calculate the probable drawn scale to emulate the Ptolemaic ratio and the Roman Mile/Stadia graticule. The facsimile map scales c68mm per degree of Latitude, which is the equivalent of 59.13 miliarium or 76.87 Roman miles. This was undoubtedly meant to be 60 miliarium per latitude degree. But as the map is a Ptolemaic base ratio, 11/20, and it appears is based upon the original Roman Survey, we can judge the graticule to have been 75 x 41.25 R M or 600 x 330 stadia. This is the equivalent of 66.35mm per latitude degree. As the bordure scale was added after the maps construction and the centre marks do not align, it is quite probable that there was a minor error in the final drawing of the latitudinal scale. But it must also be realised that although we now utilize the millimetre, the map would have been drawn using the Inch scale. The Statute Inch is 25.4mm and the Roman Uncia 24.674mm. Thus if the 75 RM graticule is correct at 66.35mm (or the slightly inaccurate 68mm) then it is the equivalent of 2.61 inches (2.667) or 2.689 Uncia (2.756). Basically One Degree of Latitude would appear to have been drawn as 22/3 inches (2 ¾) which gives a longitudinal scale of 1.467 inches (1 ½). The paucity of mathematics in this era would lead us to consider that a graticule of 1 ½ x 2 ¾ inches was intended. This is very apt as the Gough Map graticule has been deduced by this author as, 2 x 3 2/3 inches. Did Saxton just reverse the ratio base and scale down his map accordingly. The scales are; Saxton 3/2: 11/4 or 6/4: 11/4 and Gough is 2: 11/3 or 6/3: 11/3. Therefore as Cs1D07 illustrates, with Cantium Promontory aligned we can construct a 600 x 330 stadia graticule which aligns across the landscape of the Geographical Ptolemaic Map (7A) and the Saxton Map (7B). 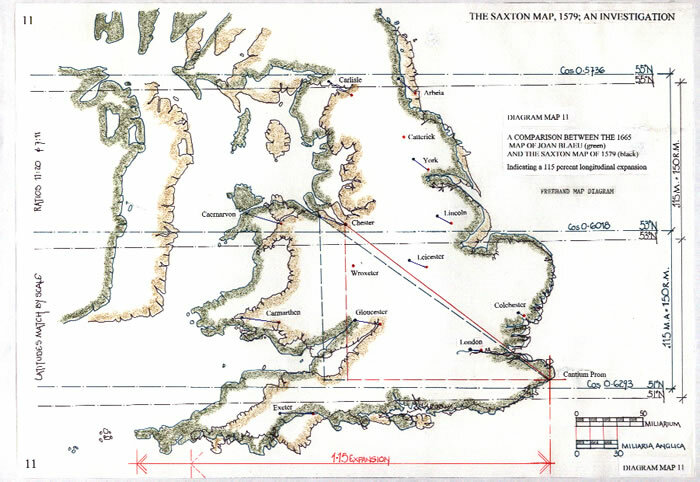 For an actual comparison, again using Cantium Promontory as the zero point, Diagram Map 8 overlays the Saxton Map upon the Geographical Ptolemaic Map and illustrates just how accurately Saxton transferred the Roman Survey Details to his base map, with each of the Fortress sites doubly indicated. Preceding the Saxton map of 1579 by some 200 years, the Gough Map, equally accurate for its age, has been analysed by this author to show that it is based upon the same Roman Survey and Fortress positions. 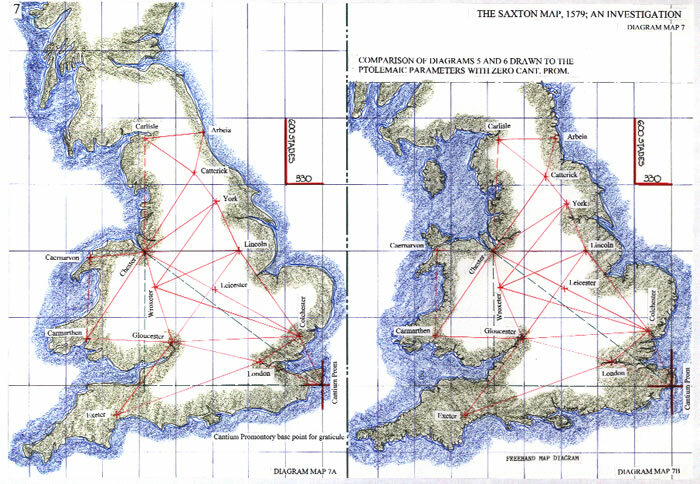 Cs1D09 has three maps in outline super-imposed upon each other: The Geographical Ptolemaic Map; The Gough Map and The Saxton Map. These are all aligned from the zero point of Cantium Promontory and drawn on a graticule of 600 x 330 Stadia. Saxton chose wisely by not including Scotland upon his map. The Gough draughtsman guessed the profile, but both delimit the Scottish border accurately. 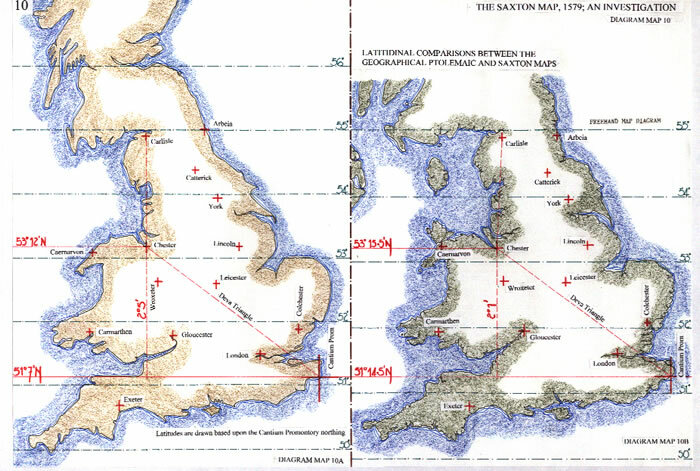 The latitudinal scale of the Saxton Map and the Geographical Ptolemaic map are compared on Cs1D10.Again Cantium Promontory is used as the alignment point and the latitudes drawn accordingly with Cantium Promontory set at 51° 7’ on Diagram Map 10A and 51014.5’ on 10B. The maps realign quite perfectly at 55° N, the Solway Firth and the limit of the Roman World after 124-128AD when Hadrian’s Wall was constructed. Saxton’s map is wildly inaccurate after this point as is the Gough Map. 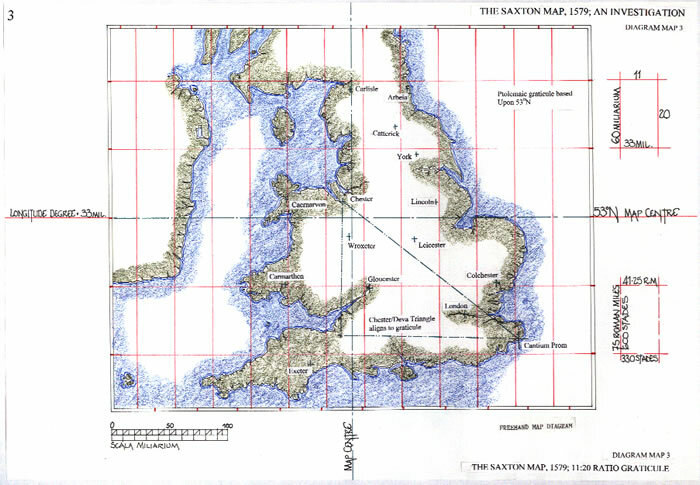 The Saxton Map is probably the last of a long tradition in English mapping, that of using the original Roman Survey of the first and early second centuries AD. It is also one of the last to use the strict Ptolemaic ratio. To have surveyed 52 counties of England in 5 years, including the draughtsmanship required to produce on average 6 maps per year required prior knowledge. That would have been survey data of sufficient quality to short cut the land measuring and plotting of each and every Town, River, Hill and feature the maps indicate. The 15 set points of the Roman Survey would form a perfect base for triangulation. The development of survey techniques, some of which were in fact well known in antiquity, especially Mesopotamia and Egypt, aided Europeans in their quest for geographical maps. The gradual loss of the Roman numeric system and its cumbersome methodology, to be replaced by the Indian digits and of course the Zero, encouraged mathematicians and hence made survey calculations regarding angular projection simple. Thus Christopher Saxton was in the right place at the right time and able to use the advancing mathematics, the advanced instruments, and, had the benefit of the Roman Survey Data. Had the data concerning the relative positions of the Roman Fortresses, available for some 1400 years, been lost in the dissolution of the monasteries, one wonders if Saxton’s maps would have been achieved in such a short time and be so excellent in presentation. Certainly it would not have been achieved in 5 years! But where is the detail survey? Is this the reason that Saxton’s survey notes are missing? Saxton’s real employer, William Cecil, Lord Burghley encouraged the formation of the intelligence gathering service under Sir Francis Walsingham, and was a brilliant and meticulous administrator. Was the information so highly prized that it was destroyed or is it hidden in some archive? John Norden, (1548-1625) undertook a survey of Northamptonshire starting in 1588 and completed a map of the county three years later13. Despite seeking the patronage of Lord Burghley he was unable to raise the funds to complete the national survey and only five county maps were printed. But, the maps of John Norden included the roads of those counties. Perhaps even then this was a step too far as he started the year of the Spanish armada. Obviously Lord Burghley was not amused! 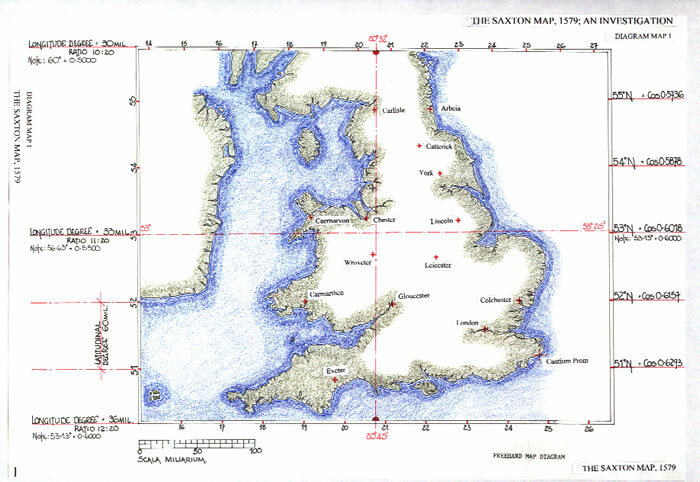 Prior to Christopher Saxton there were several cartographers who produced a map of England and Wales. Perhaps the most competent was the Welshman Humphrey Lhuyd (1527-1588). However his map of England of Wales was published by Abraham Ortelius in 1573, on the continent, not in England! Following Saxton were John Norden (1548-1628), who we have discussed, and John Speed (1552-1629), who also used a base map by none other than Saxton! He however duly acknowledges the original cartographer. 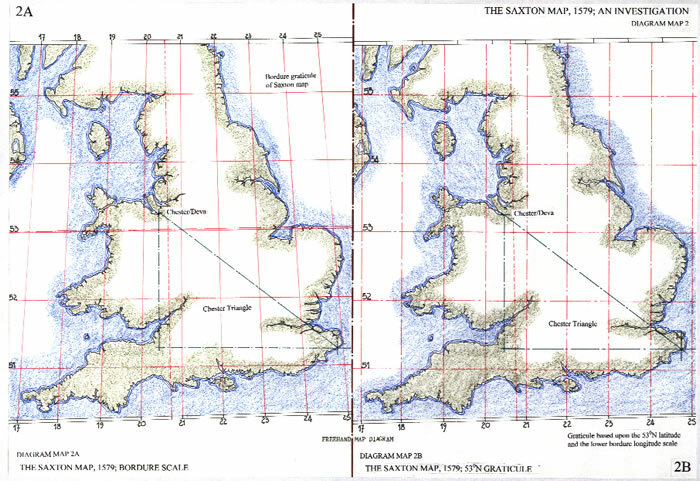 The three maps indicate; on map one, a latitudinal spread of 50N to c61N; map two, a spread of 50N to 58°30N and map three, from 50N to the Solway Firth at 55N, precisely as Saxton’s map indicates. Or is it? Certainly it has the appearance of being a direct copy but, proportionally it is far too wide. The longitudes appear to match but are numbered differently. Joan Blaeu has maintained the latitudinal measure and apparently mis-transcribed the longitudinal measure. This is no doubt due to the fact that, as with Saxton’s map, the graticule of Joan Blaeu’s map was drawn after the map was completed and thus the draughtsman used a separate graticule to actually draw the map. This can be shown to be based upon the 53N longitudinal measure of the map and was a rectangular graticule of c57 x c36 Miliaria Anglica; a ratio of c0.6316, which is actually cosine 50.83 degrees, and probably was meant to represent the 50N southern bordure. The measure can also be quantified by multiplying the c57 M. A. x 1.3 to note the actual Roman Latitude Degree of 75 Roman Miles. But Saxton’s map is based upon a central graticule of Ptolemaic origin, 11:20. Thus it indicates a transcription error of Joan Blaeu in redrawing Saxton’s map. The difference between a 0.55 ratio (11:20) and a 0.6316 ratio is 1.15 increase. By examining the two maps as Diagram Map 11 indicates it can be shown that the longitudinal expansion of Joan Blaeu’s map “Anglia Regnum” is precisely x 1.15 more than the Saxton map of 1579. Thus, after 1579, Saxton’s map, so very accurate in all of its parts, was transported to Amsterdam and redrawn. But a problem regarding distance measure obviously occurred. Joan Blaeu states quite clearly that one minute of the Earth’s circle is 1000 paces or the Italian Mile and equates that to the English Mile. But the scale bar on Saxton’s map is Miliarium, equivalent to 1.2 English Miles or 1.3 Roman Miles. If the scale bars of the two maps are compared like for like, the Miliarium of Saxton’s map is the Miliaria Anglia of Blaeu’s map. Thus the world of Blaeu, as he so clearly states in his text, is not 21600 Italian Miles (or English Miles), but 216000 stadia or 27000 Roman Miles, and the German League is in fact 5 Roman Miles; i.e. 27000/5400, with one degree at 15 German Miles and therefore 75 Roman Miles. As Cs1D11 indicates, the latitudinal markers are quite precise when the maps are aligned, even at Cantium Promontory, with Blaeu having the more accurate 51N by placing Cantium Promontory at 51° 07N to Saxton’s 51° 14.5N. We can also indicate the Ptolemaic preference for Cantium Promontory to be accorded a specific longitude by projecting what appears to be the original graticule northwards from the southern bordure, 19E marks it well enough. Thus, yet again it is apparent that these maps were drawn upon a rectangular graticule which was superseded by a bordure graticule which conformed to the mathematics of a sphere or globe as perceived by the cartographer. As with Saxton’s map, because the bordure graticule was not available for the draughtsman to utilize, the subsequent accuracy diminished. But why Joan Blaeu chose to use an in-accurate ratio and change just a part of Saxton’s map is a mystery. M J Ferrar December 2008. 1B Ferrar, Michael J, (2008), The Gough Map; An Investigation. This paper is a full examination of the data that was available, the methodology and the antecedents of The Gough Map. It determines the scale and graticule used and the internal accuracy of the layout compared to a like plot of Britain. 2 Delano-Smith, Catherine and Kain, Roger, J P, (1999), English Maps, A History. University of Toronto Press. Chapter 3: Mapping Country and County, discusses the sixteenth century surveying and mapping knowledge. Christopher Saxton’s maps are dealt with in detail, page 66. Chapter 2: page 40, Maps of England deals with earlier maps and particularly The Gough Map. 3 Brown, Professor R Allen, (1980), English Castles and Castles, A History and Guide. Blandford Press, Dorset. 4 Frisius, Gemma, (Antwerp 1533), Libellus de Locorum Disribendorum Ratione. Methodology and triangulation in written form for the first time, but perhaps not the first usage! 5 ibid note 2.see page 61, potential mapmakers. 6 Knowles, David and Hadcock, R Neville, (1953 and 1971), Medieval Religious Houses, England and Wales .Longmans Green and Co. London. Morris, Richard, (1989), Churches in the Landscape. J. M. Dent and Sons Ltd.
7 Tyacke, Sarah and Huddy, John, (1980), Christopher Saxton and Tudor Map Making. British Library, London. 8 iibid note 1B. This point is fully discussed within the paper and the seed change from a Triangular to a Rectangular Britain noted. 9A Wiseman, Timothy P, (1992), ‘Julius Caesar and the Mappa Mundi’, in, Talking to Virgil. Exeter University Press.Pages 22-42. The argument in favour of the 4th century AD texts being a correct description of the survey facts is put cogently and concluded as a positive action. The Roman Survey is examined through later landscape works to determine if retro-survey techniques can ascertain its veracity. The conclusion is very positive. 10 Ferrar, Michael J, and Richardson, Alan, (2003), The Roman Survey of Britain. British Archaeological Report, Bar 359, Oxford. The landscape of Britain is used to indicate results of the survey by the Roman Army and Administration to lay out what may be described as a planned environment. 11 Stevenson, Edward L, (1932 and 1991), ‘Claudius Ptolemy, The Geography’. New York Public Library, and Dover Publications, New York. A partly flawed translation, but the data concerning the longitudes and latitudes, as well as the proposed proportional plot for each map is very useful. 12 Connor, R D, (1987), The Weights and Measures of England. Trustees of the Science Museum, London, HMSO. Chapter V. The Mile and the League. This is a full discourse of the various measures, the melange of Roman and English units and the mistaken translations of those measures. 14 Joan Blaeu, ATLAS MAIOR of 1662 and 1665, published by Taschen, Cologne. (2006.) All 11 volumes are available.